Everyone saw more precipitation (rain and melted snow/ice combined) than average for January. Cincinnati was the wet spot with 4.11” for the month (1.11” above average), with Columbus and Dayton coming in with 3.09 and 3.25” respectively (both about 0.50” above normal). Indianapolis and Chicago both were only slightly wetter than normal, with 2.82” of precipitation at Indianapolis and 1.96” in Chicago. While these numbers may seem paltry, January is one of the driest months of the year, and a lot of that precipitation fell as snow. Speaking of snow, every main climatologic station also came in with a positive snowfall departure for January, helping to erase some deficits that had grown through December. Chicago was the breadwinner with 18.2” (7.4” more than normal), followed by Cincinnati (14.6”, +8.1”) and Dayton (14.4”, +6.5”). Indianapolis and Columbus rounded it out for snowfall with 11.7” (3.1” above average) and 11.3” (2.1” above average) respectively. There were a few lighter clipper and snow shower events through the month, typical for the Midwest and Ohio Valley, along with a couple of larger, region-wide storms. The first occurred January 12th and 13th. 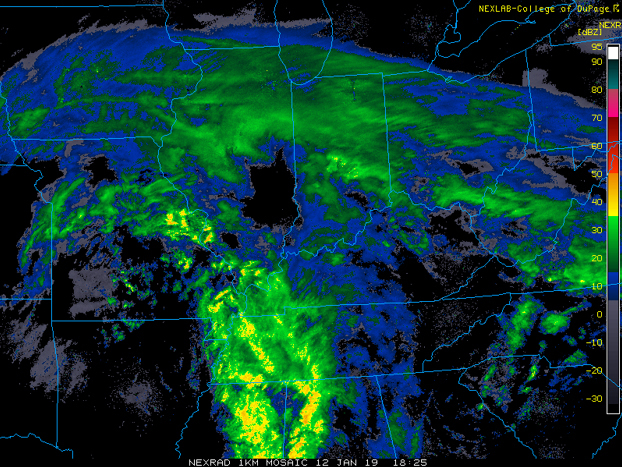 This storm dropped accumulating snow on much of the region, including over 7” in Indianapolis and Dayton, 6.6” in Cincinnati, 4.1” in Columbus and 2.3” for Chicago (with more on the south side). Another storm dropped snow region-wide January 18th-20th, with 5” for Chicago and Cincinnati and 2-4” for Indianapolis, Columbus, and Dayton. 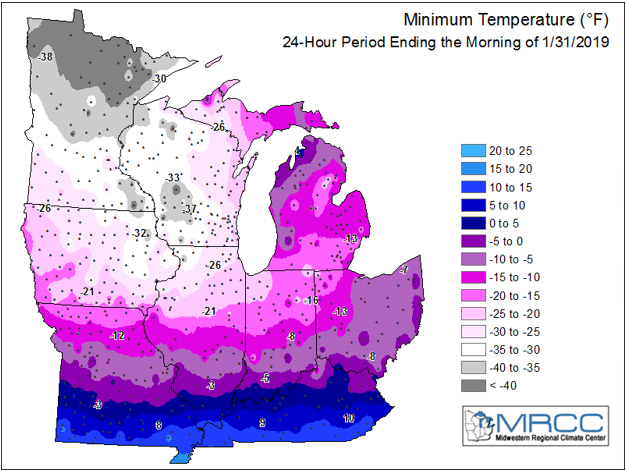 Lowest temperatures observed during the late-January cold blast, courtesy of the Midwest Regional Climate Center. The most anomalous weather of the month came to close it out, when record-setting cold set into large portions of the region. Chicago saw 5” of snow on January 28th, followed by lows of -23 January 30th, -21 January 31st, and a high of only -10 degrees on the 30th. 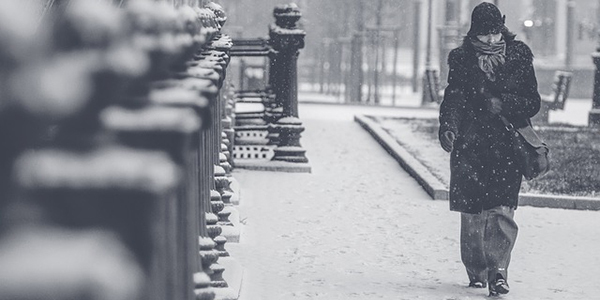 With an average temperature of -16.5 degrees, January 30th was the second coldest day on record for Chicago. They spent 52 consecutive hours below 0 (forth longest stretch on record, longest such stretch since February 1996). Chicago missed their “all-time” record coldest temperature, but Rockford did not, coming in with a low of -31 on January 31st! Indianapolis also broke multiple records, with a new daily record low of -11 on January 30th and a high of only 3 degrees that day (also a record for the date). Ohio was certainly cold, but not record breaking, with Columbus, Cincinnati, and Dayton all dipping below 0.